A good return to the blinds and Bin 18 served Vino Miami well as we forged ahead in the Old world with a nice pairing of Cotes du Rhone’s and Chablis. Many thanks to Jeff for coordinating and arranging our return to the blind format after our break in May. We missed Matt Jewell only a few blocks away seeing Miami win Game 3 of NBA Championship series and now a part of Miami Heat history. 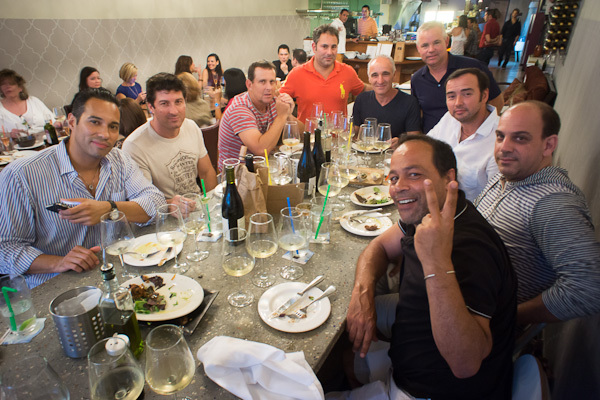 Nice to have long term Vino member extraordinaire Saad returned as well and put the group at a needed 10 for the evening. Jeff’s guest Wesley was a welcome addition as well as Andrew’s guest Julio as well. Many thanks to Wesley for the well needed tasting notes with more to come, and a very nice bottle of 2010 Cotes Du Rhone “Calendal” a terrific end to our Cotes tasting. The winning white was wine Chablis wine #1 2009 Vaillons – Domain William Ferve with a overall score of 6.8 and ranked a even 8 by our guests Wesley and Julio provided by Mosheim/Mahmoud/Issa/Smith. Second place goes to wine #3 at very close to the winning score at 6.25 is the 2010 Premier Cru – Montmains from Cohen/Jewell and scored a 8 by Wesley and 3 by Julio. Third place was Wine #2 with an overall score of 5.124 was the 2008 Kermit Lynch Les Truffieres and our guest enjoying with a 8 and 4 score provided by Hege/Tenen/Gamson. Mixed bag as it seem some Vino members were into Chablis and some were not in on the famous French white, with scoring random at best. The winning red was wine #1 2009 Domaine De LA Janasse Les Garriques with an overall score of 7.24 and scored 6 and 8 by our guest provided by Hege/Tenen/Gamson. 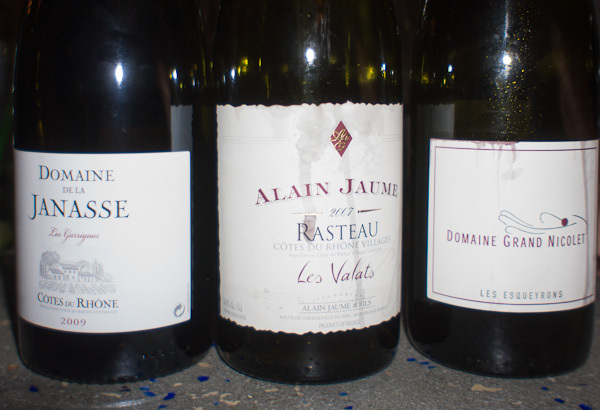 Second place was awarded to wine #2 the 2007 Alain Jaume “Rasteau” Les Valets at 7.125 and scored 6 and 5 by guests provide by Mosheim/Mahmoud/Issa/Smith. Third place the 2007 Domaine Grand Nicolet Les Esquayrons “Rasteau” at 6.5 and scored 8 by Wesley and 5 by provided by Cohen/Jewell Two “Rasteau” was an interesting connection and the same year made this notable. Tight scoring on all three wines seem to have everyone enjoying the taste and finish. Wesley did a terrific job of providing us with tasting notes and have provided them below for reference and for comparison and look to have tasting notes going forward. 1. Light color/Soft floral bouquet on the nose/Hints dry soft quince on the palate/ Crisp finish. 3. Light color/Soft-bland like paper hints on the nose/Minerals and stones on the palate with Light body/Soft long finish. 3. Dark plum color/Soil and earth with hints berry nose/Light peppery with hot spices to warm the palate/Complex. We set our next tasting on the calendar for July 17th hosted by Andrew Cohen and Matt Jewell and look forward to our next tasting. Wine details and venue will be announced soon. 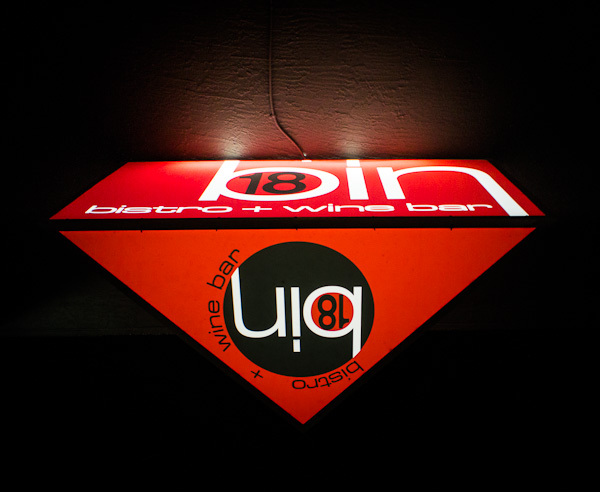 Wine Club Miami is a group of close friends who enjoy wine and their monthly night out together in Miami. “I See!” said the blind man.